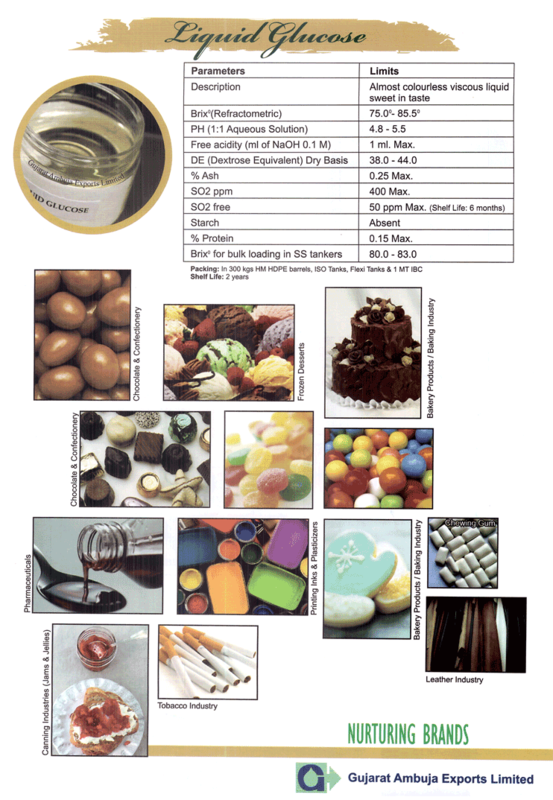 Liquid Glucose (Sweetose) is a clear, colourless, viscous solution, making it compatible with the physical properties desired in the end products. Chemically, Liquid Glucose has functional properties such as high fermentability, viscosity, humectancy – hygroscopicity, sweetness, colligative properties and its role in Maillard’s reaction. The properties of Liquid Glucose are directly related to the DE (Dextrose Equivalent) and so are its effects and flavour, freezing point depression and osmotic pressure. Other properties such as cohesiveness, bodying characteristics, foam stabilization and prevention of sugar crystallization are inversely proportional to the increasing DE. The reducing action of glucose makes it incompatible with strong oxidizing agents, which has advantages of its own. To control crystallization, body appearance, sweetness, osmotic pressure and as a preservative in hard-boiled candies, jams and jellies. A baker will ferment it with yeast for raising the product. A dairyman will add it to ice cream, to improve the texture and palatability of the ice cream and enhance flavors. It is usually the cheapest source of total solids. It has become common in the dairy industry to substitute all or a portion of the sucrose content with sweeteners derived from corn syrup. This sweetener is reported to contribute to a firmer and chewier body to the ice cream, it is an economical source of solids, and improves the shelf life of the finished product. 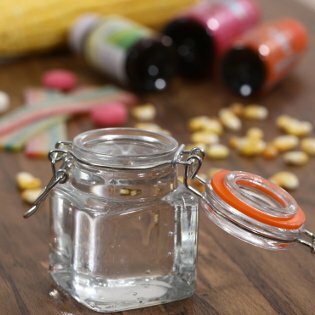 Liquid Glucose used in cough syrup and vitamin based tonics. It is also used as a base of artificial honey & as a granulating agent for tablet coating. It is used in curing and imparting flavour in tobacco. Liquid Glucose is used in tanning to enhance weight and ensure a softer texture. Used to precipitate chrome into the body of the leather due to its reducing action. It is added to shoe polish to prevent it from caking and to help it to give a better and quicker shine. Sulphur free glucose is available for specific customers with SO2 content of 40 ppm max. Free acidity (ml of NaoH 0.1 M) 1 ml. max.